We are excited to be sponsoring the Alpine Electronics Jeep Build in 2015 with our Rightline Gear Jeep Storage Bags. Alpine will be taking their Jeep to the Consumer Electronics Show and many other lifestyle oriented events over the course of the next year. 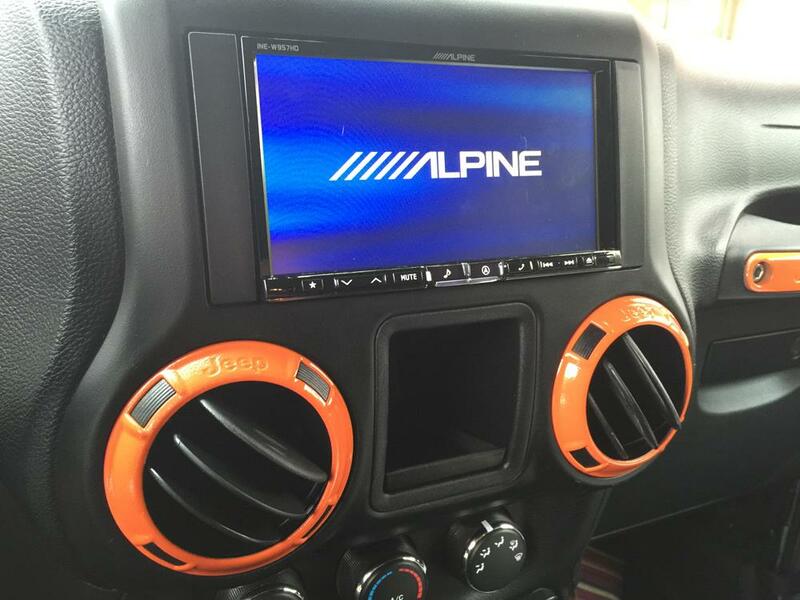 Alpine Electronics has returned the favor by sponsoring our SEMA 2015 Jeep Build. 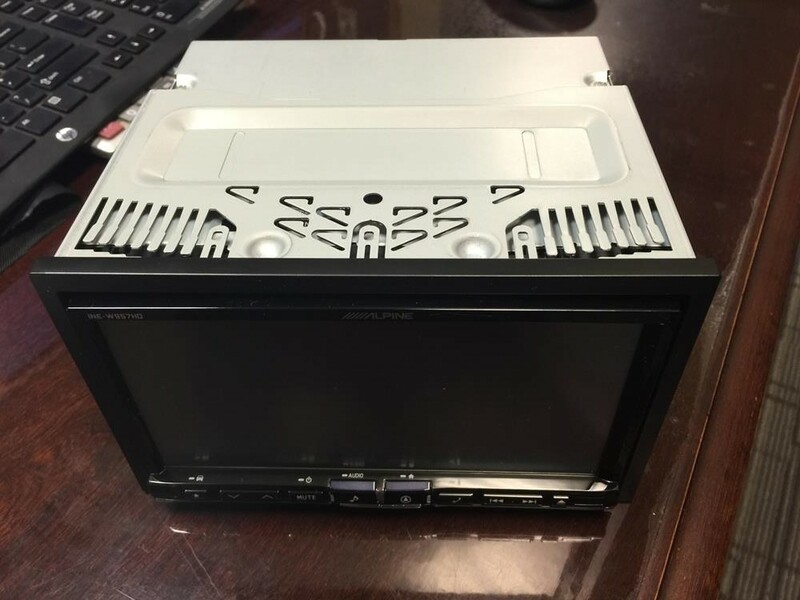 We are thrilled to have their model INE-W957HD Navigation Receiver on board for our long trek to and from Las Vegas. If you are like me, you have had enough of trying to look at cell phone navigation while driving. I upgraded my phone this year to the Apple 6 plus, but even so, it is hard to focus on the screen and hear the directions while driving (it could partially be because the music is turned up too loud, but that is part of the driving experience-right?). Even worse is trying to talk on the phone while driving a stick. There is a limit to how long you can hold your phone between your ear and your shoulder. I was definitely looking for a hands free option. I had tried a device that held the phone on the dash a few months back, but the adhesive failed to hold to the dash after a month or two. The Alpine unit arrived in impressive fashion. It has a 7″ display and fits in the same mounting hole as the stock radio. I used Garner’s Stereo Center in Fletcher, NC for the install. I needed to add an interface (wiring harness), an antenna adapter, and a frame mount. They did a quick quality job and the unit looks great. I kept my steering wheel controls active to interact with the unit. There is much more functionality that I am sure we will discover in the process. 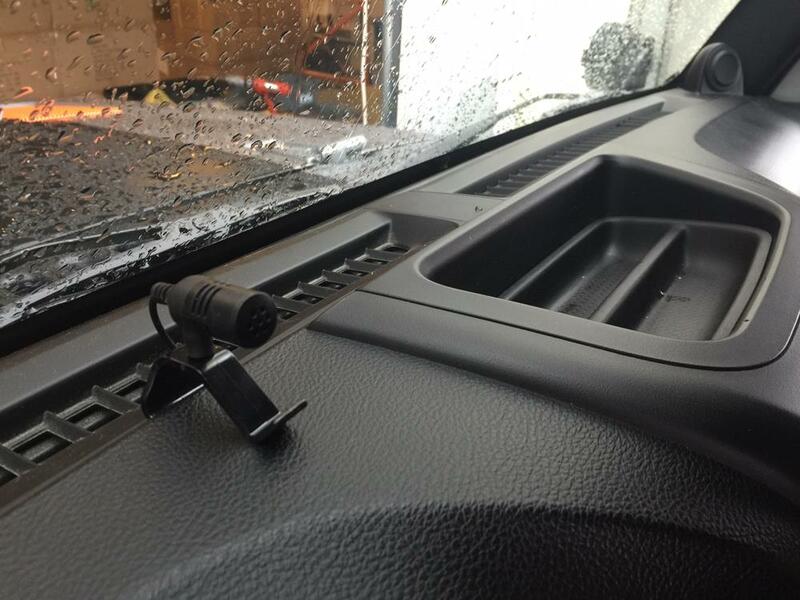 I chose to have Garner’s mount the microphone just to the left of the storage compartments on top of the dash. 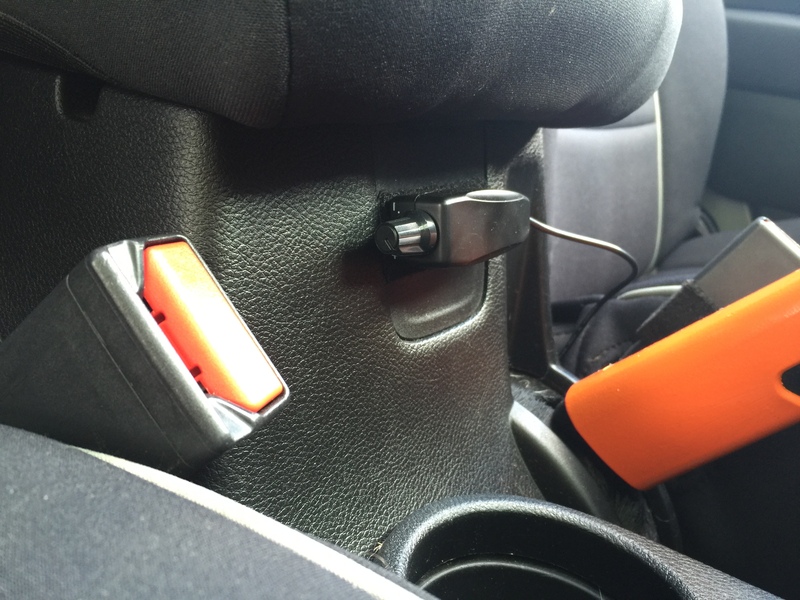 The USB cable end was placed in the glove box. I will update the blog after we are experts with the unit; looking forward to the journey! After becoming familiar with the Alpine unit, I found the functionality to be great and I use the features like the navigation, the hands free phone, and the bluetooth connection with my iphone almost every day. My only desire was to get a little more bass power in the audio. First, I added the Alpine KTP-445U Head Unit Power Pack. 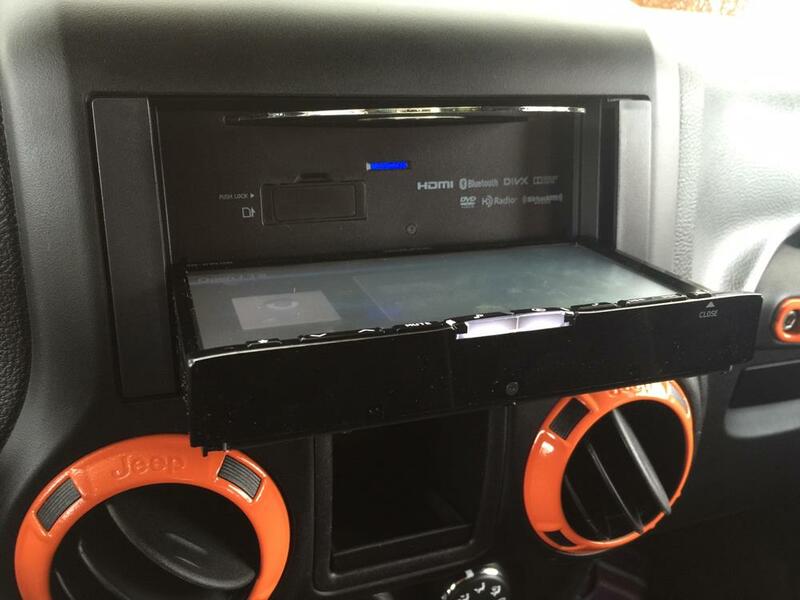 It fits behind the dashboard where it will stay dry and you don’t have to make room for it inside the Jeep. The amp provided a big improvement to the overall sound quality and gave more power, especially while driving around with the top down. Call me crazy, but I still wanted to hear a little more bass to balance out the frequency response. Enter in the Alpine PWE-S8 Compact Powered 8″ Subwoofer. Now we are talking!! I only had one problem, I could not mount it under one of the seats as planned. I could not put it anywhere in the rear of the Jeep as it would likely get wet with the top down. Time to get creative. 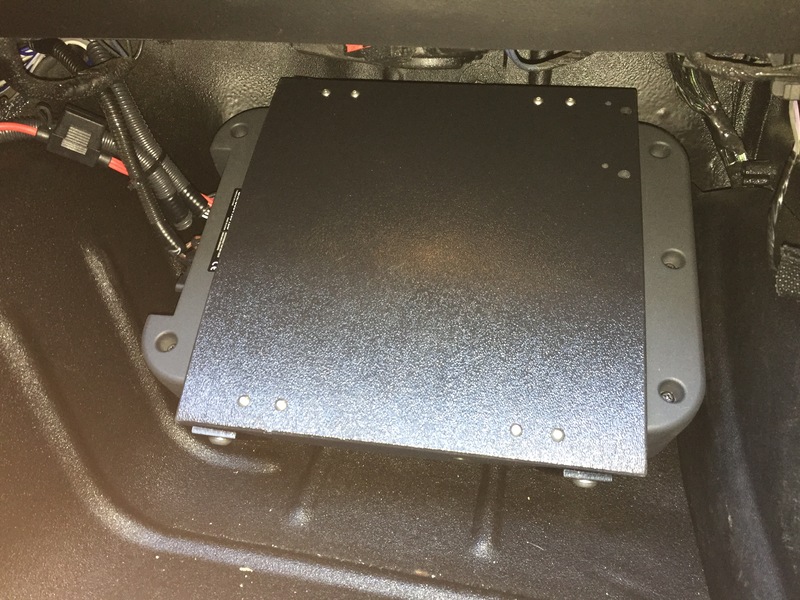 I had the idea of mounting the unit on the passenger side floor board of the Jeep. The floor board curves up and it seemed possible to mount the sub on the curve to keep it higher than any water that might accumulate there. I decided it may be a good idea to leave the floor plug permanently out on that side as well. I was able to use the plastic mounting bracket that came with the sub to hold it. I had to make some ” legs” out of angle brackets courtesy of Ace Hardware. A good coat of black VHT paint and I bolted the angle brackets to the plastic mounting bracket. I got (4) rubber bushings from O’Reilly’s to go between the angle brackets and the floor board. The bushings act as a spacer under the feet and help level out the curved shape of the floor board. Now comes the insanely difficult part – drilling (4) holes in the floor board to match up with the bolts that go through the angle brackets and bushings. This process was a do- it-in-the-parking-lot-of-Ace-project. I only went in the store (4) times to get more/different items to complete this job. In the end, I was thrilled to make it work without having to drill any extra holes in the floor board. 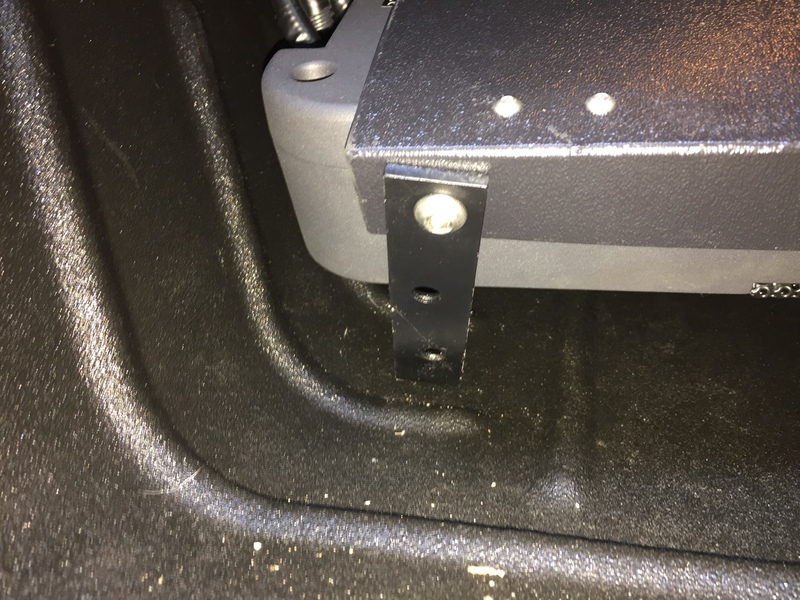 It required (2) people, (1) under the Jeep and (1) at the passenger side floor board to get those bolts connected. Luckily I had a neighbor who was up for the challenge. The mounting job looks great and the system sounds even better. 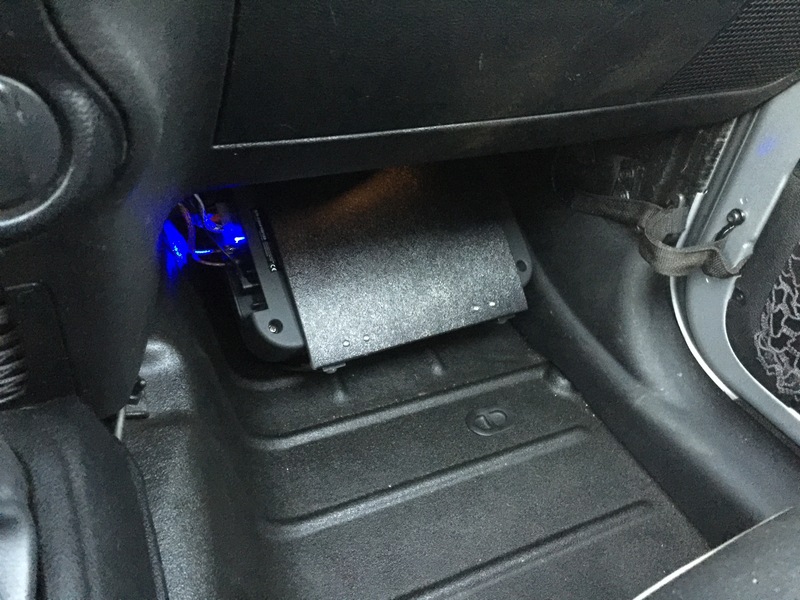 Alpine provides a remote control for the volume level of the sub. It is quick and easy to tweak this knob and it is really necessary every time your source changes. A great feature so you don’t have to go into the menus on the screen until you drill down to sub-woofer volume. I am thrilled with the sound of the system with the addition of the sub. I haven’t fully tweaked the parametric eq yet, but I was able to raise the highs a little due to the solid bass backdrop. I can already hear the frequencies separating out across the spectrum. With a good road trip under my belt, I should be able to dial everything in perfectly. This entry was posted in SEMA 2015 Jeep Build. Bookmark the permalink.